Do you support the Act of Declaration of Independence of Ukraine? Voters were asked "Do you support the Act of Declaration of Independence of Ukraine?" The text of the Declaration was included as a preamble to the question. 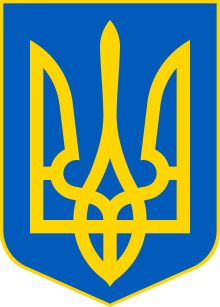 The referendum was called by the Parliament of Ukraine to confirm the Act of Independence, which was adopted by the Parliament on 24 August 1991. Citizens of Ukraine expressed overwhelming support for independence. In the referendum, 31,891,742 registered voters (or 84.18% of the electorate) took part, and among them 28,804,071 (or 92.3%) voted "Yes". On the same day, a presidential election took place. All six candidates campaigned in favour of a "Yes" vote in the independence referendum. Leonid Kravchuk, the parliament chairman and de facto head of state, was elected to serve as the first President of Ukraine. From 2 December 1991 on Ukraine was globally recognized as an independent state (by other countries). That day the President of the Russian SFSR Boris Yeltsin did the same. In a telegram of congratulations President of the Soviet Union Mikhail Gorbachev sent to Kravchuk soon after the referendum, Gorbachev included his hopes for close Ukrainian cooperation and understanding in "the formation of a union of sovereign states". Ukraine was the second-most powerful republic in the Soviet Union both economically and politically (behind only Russia), and its secession ended any realistic chance of Gorbachev keeping the Soviet Union together. By December 1991 all former Soviet Republics except the RSFSR and the Kazakh SSR had formally seceded from the Union. A week after his election, Kravchuk joined with Yeltsin and Belarusian leader Stanislau Shushkevich in signing the Belavezha Accords, which declared that the Soviet Union had ceased to exist. The Soviet Union officially dissolved on December 26. The ballot paper used in the referendum, with the text of the Declaration of Independence printed on it. Ukrainian media had converted en masse to the independence ideal. Polls showed 63% support for the "Yes" campaign in September 1991; that grew to 77% in the first week of October 1991 and 88% by mid-November 1991. 55% of the ethnic Russians in Ukraine voted for independence. 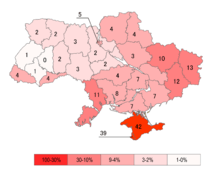 The Act of Independence was supported by a majority of voters in each of the 27 administrative regions of Ukraine: 24 Oblasts, 1 Autonomous Republic, and 2 Special Municipalities (Kiev City and Sevastopol City). Voter turnout was lowest in Eastern and Southern Ukraine. 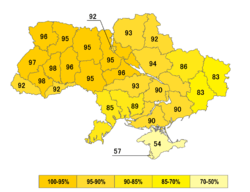 Calculating the "yes"-votes as a percentage of the total electorate reveals a lower percentage of all possible voters in Kharkiv, Luhansk, Donetsk, and Odessa Oblasts and Crimea supported Ukrainian independence than in the rest of the country. 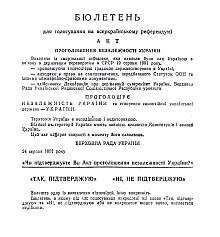 "Law of Ukraine N 1660-XII on organization of referendum" (in Ukrainian). 1991-10-11. "Law of Ukraine N 1661-XII on text for referendum" (in Ukrainian). 1991-10-11. "The funeral of the empire", Leonid Kravchuk, Zerkalo Nedeli (Mirror Weekly), August 23 – September 1, 2001. Available online in Russian and in Ukrainian. "Confide in people," Dr. Stanislav Kulchytsky, Zerkalo Nedeli (Mirror Weekly), December 1–7, 2001. Available online in Russian and in Ukrainian.